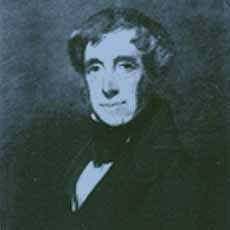 Clement Clarke Moore was born in New York City in 1779. He was the only son of Benjamin Moore, president of Columbia College and bishop of the Protestant Episcopal Church in New York. He was a graduate of Columbia College and got a Masters Degree from there in 1801. Moore married Catherine Elizabeth Taylor in 1813, and they settled at Chelsea, in what was then a country estate outside New York City. A biblical and Hebrew scholar at General Theological Seminary, a coeducational institution in New York City that trained clergy for the Protestant Episcopal church, he is popularly known for his poem "A Visit From Saint Nicholas" which was a Christmas gift for his five children in 1822. From 1840 to 1850, he was a member of the board of managers at "The New York Institution for the Blind". This school was located on 34th Street and 9th Avenue during that era. Moore died in 1863.